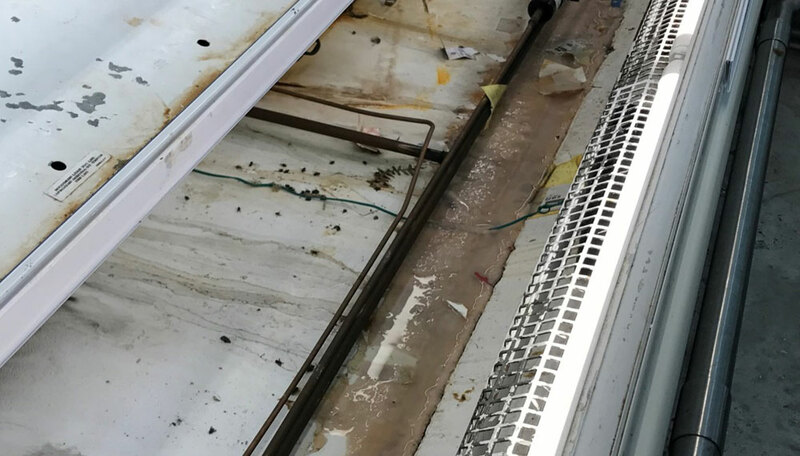 FLEETWASH can ensure your refrigeration units and cases are kept sanitary and running well. We carefully hand-clean these intricate units inside and out, increasing efficiency, reliability and food safety. Why are Clean Refrigeration Units Important? 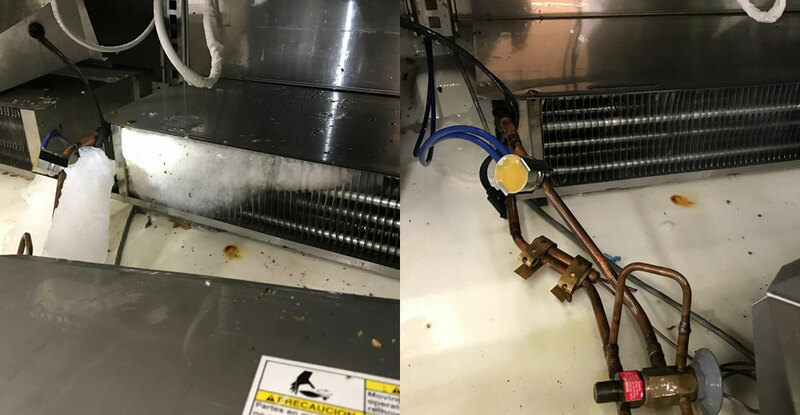 Dirty refrigeration units may increase the incidence of food contamination and put your clientele at risk. 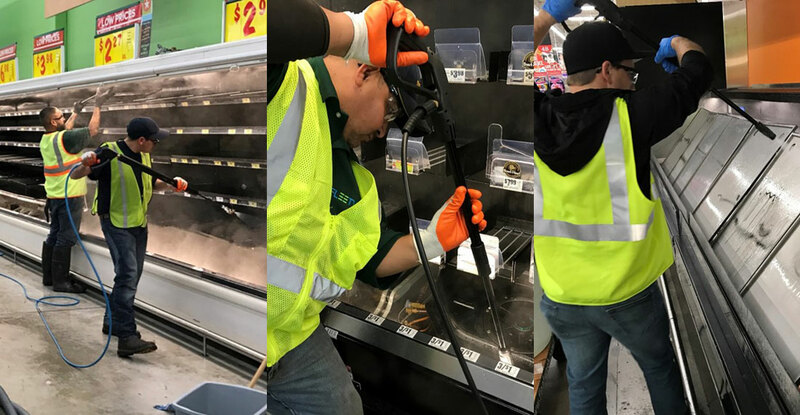 While most store managers understand the need to regularly clean the exteriors of cases and floors of food-focused retail space, regular cleaning of case interiors is more cumbersome and often overlooked. The intricate inner workings of retail refrigeration units can hide dirt and decomposing food particles. These warm, dirty spaces can become breeding grounds for microorganisms and dangerous bacteria. Dangerous foodborne pathogens such as Listeria, Salmonella, E.coli and more can find their way into your food cases and put the health of your clientele and employees at risk. 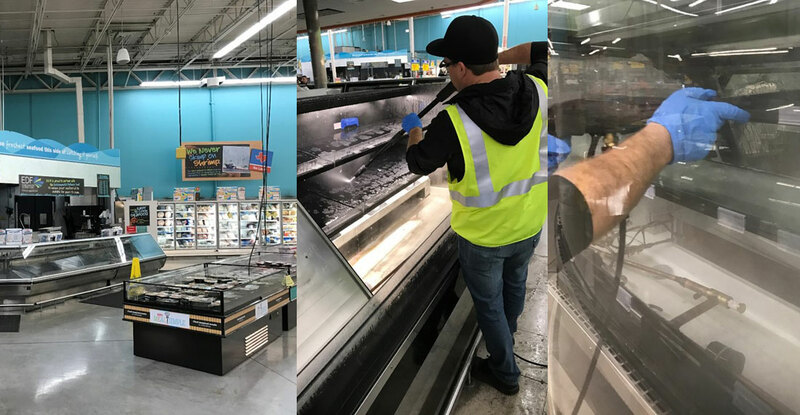 FLEETWASH has the experience, expertise, and professionalism you can count on to keep your refrigeration units regularly serviced and running well. PLUS you can rest assured each job is completed to EPA standards and in an environmentally sustainable way – we guarantee it. Over 700 FLEETWASH mobile units are deployed daily servicing companies – large and small – from coast to coast. FLEETWASH trained field agents complete every job, every wash, every wastewater elimination according to the procedures FLEETWASH has standardized around the country. Last year alone, FLEETWASH completed over 100,000 HVAC and refrigeration units… and countless buildings, awnings, and sidewalks. Always scheduled. Always professional. Always on time. Always at your service. FLEETWASH Professional crew will park the water recovery and power-washing vehicles near rear entrance, away from the front of the store and store customers. FLEETWASH crew leader always speaks with the Store or Facility Manager to confirm the scheduled servicing, explain the entire cleaning process, and formerly document the number of FLEETWASH crew members and official start time for each work order. FLEETWASH will bring all material and supplies into the store, including our customized mobile pressure hose and vacuum hose system. 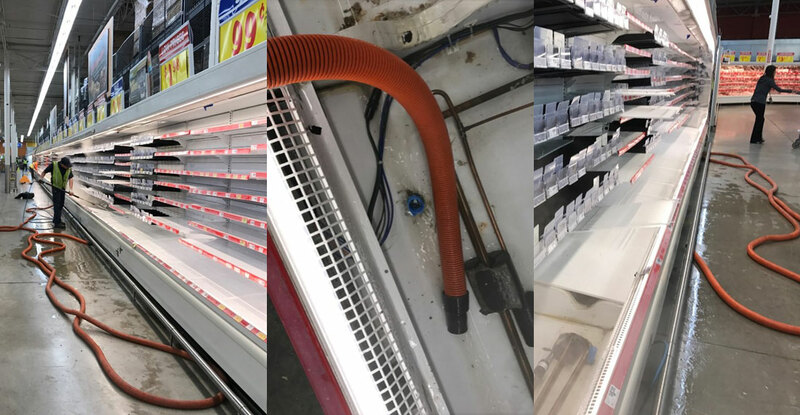 FLEETWASH will vacuum, hand scrub, and wash the exterior and interior of all refrigeration units within the store. We power-wash and areas that can be safely power-washed. FLEETWASH will remove all panels and expose fans, coils, and electrical equipment for cleaning. Again, all areas vacuumed, hand scrubbed, and washed. FLEETWASH uses a diluted foaming, non-acid, biodegradable, coil cleaner on site. Coil cleaner is applied with a pump sprayer. FLEETWASH crew members will use different wands and nozzles depending on the application and open or remove cover panels on units to gain access to coil area. FLEETWASH will set up their patent-protected water recovery system in the lowest point of each refrigeration unit. All water will be contained and removed from the premises. FLEETWASH then replaces all access panels and any missing screws, and turns the power back on. FLEETWASH crew leader then talks with the store or facility manager to report any problems or concerns with any of the refrigeration units. The crew leader and facility manager will inspect each unit thoroughly before the job is considered complete. 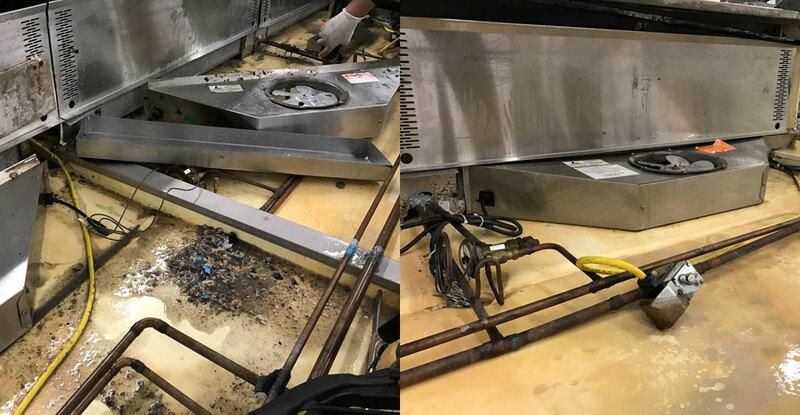 Dirty refrigeration units can lead to the growth of dangerous bacteria and microorganisms, putting food safety at risk. 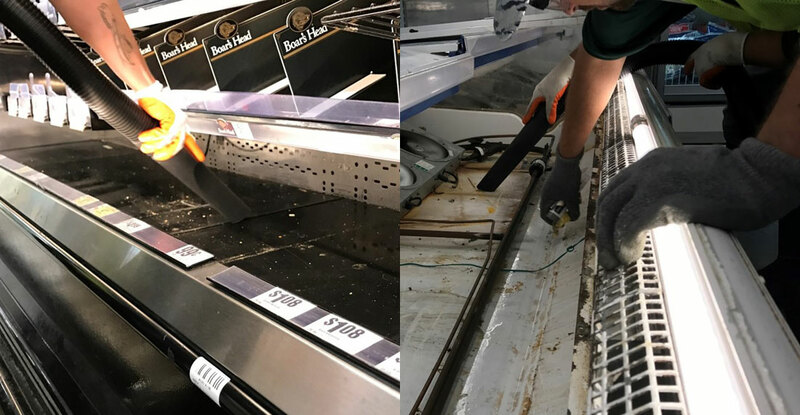 FLEETWASH begins by vacuuming and hand scrubbing the interior of empty refrigeration units. FLEETWASH power-washes areas of refrigeration units that can be safely power-washed, inside and out. Collecting all wastewater in the process. FLEETWASH crew removes cover panels on units to gain access to coil, electrical and fan areas. Again, areas are vacuumed, hand cleaned, and safely power washed. FLEETWASH will set up their patent-protected water recovery system in the lowest point of each refrigeration unit. All water will be isolated, contained and removed from the premises. FLEETWASH talks with the facility manager and inspects each Refrigeration Unit together before the job is considered complete. Your satisfaction is guaranteed. FLEETWASH has 24/7 “On Call” Servicing. FLEETWASH maintains $15 Million Liability Insurance. FLEETWASH uses a powerful, patented truck-mounted vacuum system, strong enough to reach a work area 700 feet away. 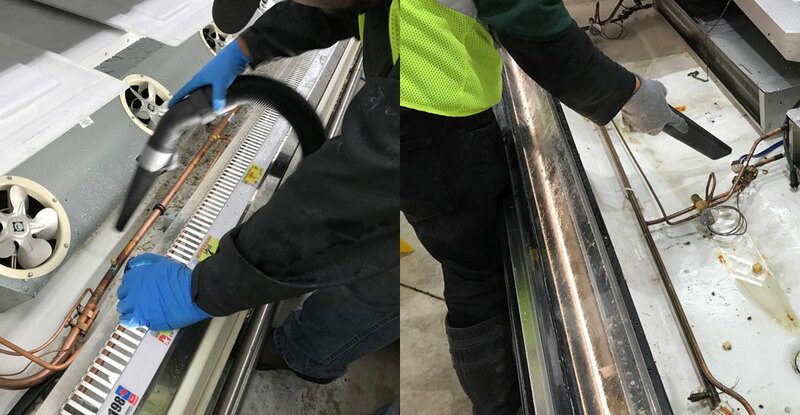 FLEETWASH takes the environmental impact of what we do very seriously, we strictly follow the regulation guidelines in your State and Local area that are designed to protect our environment from water run-off. FLEETWASH assumes all risks and liabilities for proper water isolation, collection, transportation and disposal of your waste water in compliance with your Local, State and Federal regulations. The crew always does a wonderful job. They are in and out quickly and do a good job. FLEETWASH is always prompt and courteous.